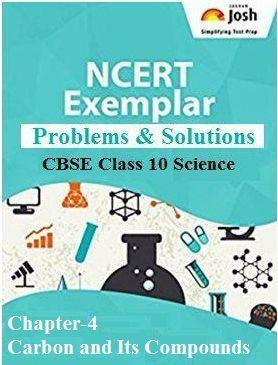 In this article you will get CBSE Class 10 Science chapter 4, Carbon and Its Compounds: NCERT Exemplar Problems and Solutions (Part-I). Every question has been provided with a detailed explanation. All the questions given in this article are very important to prepare for CBSE Class 10 Board Exam 2017-2018. Here you get the CBSE Class 10 Science chapter 4, Carbon and Its Compounds: NCERT Exemplar Solution (Part-I). This part of the chapter includes solutions for Question No.1 to 29 from the NCERT Exemplar Problems for Class 10 Science Chapter: Carbon and Its Compounds. These questions include only the Multiple Choice Questions (MCQs) framed from various important topics of the chapter. Explanation: Carbon exists only in the form of carbon dioxide gas (CO2) in air. (i) Are good conductors of electricity. (ii) Are poor conductors of electricity. (iii) Have strong forces of attraction between their molecules. (iv) Do not have strong forces of attraction between their molecules. Explanation: Carbon having four valence electrons forms only covalent compounds which exhibit less intermolecular attractions and do not have any fre electrons to carry electric current. Therefore, these are poor conductors of electricity. Explanation: Ammonia is a covalent molecule in which center nitrogen atom is bonded with three hydrogen atoms through single covalent bond. Explanation: Buckminsterfullerene is an allotrope of carbon with 60 carbon atoms which are joined together in a spherical shape. Question. 5 Which of the following are correct structural isomers of C4H10? Explanation: Structural isomers have same molecular formula but different parent chain of carbon atoms in the molecule. Explanation: KMnO4 acts as oxidising agent as it oxidized CH3CH2OH to CH3COOH by addition of oxygen atom. Explanation: It is hydrogenation reaction means addition of hydrogen to double bonds of unsaturated compounds found in oil. Question. 8 In which of the following compounds -OH is the functional group? Explanation: Compounds with –OH functional group are ended with suffix –ol. Explanation: A soap molecule contains a long hydrocarbon part and a small ionic part of -COONa group. Hydrocarbon chain is hydrophobic or water repelling whereas ionic head is hydrophilic or water attracting group. Question. 10 Which of the following is the correct representation of electron dot structure of nitrogen? Explanation: Nitrogen molecule is a covalent molecule in which two nitrogen atoms are bonded through triple covalent bond with one lone pair of electrons over each nitrogen atom. Explanation: General formula for alkyne is CnH2n−2. There must be at least one triple bond between carbon atoms. With two carbon atom, the possible structure would be H ─ C ≡ C ─ H.
Question. 12 Identify the unsaturated compounds from the following. Explanation: Alkene and alkyne are unsaturated hydrocarbon as they have double and triple covalent bonds between carbon atoms. Explanation: Chlorine shows photochemical substitution reactions with saturated hydrocarbons that occurs in the presence of light. Explanation: A micelle is a spherical aggregation of soap molecules in water in which hydrocarbon ends are directed towards the centre and ionic ends are directed outwards. Explanation: Pentane contains four C-C bonds and twelve C-H covalent bonds. Explanation: Benzene is simplest aromatic compound with six carbon atoms and six H atoms. There are three alternate pi bonds in ring of carbon atoms. Explanation: Ethanol (C2H5OH) reacts with sodium to form sodium ethoxide (C2H5ONa) along with liberation of hydrogen gas. Explanation: Butanoic acid is a carboxylic acid with four carbon atom and one –COOH group at terminal. Explanation: Vinegar is a 5%-8% aqueous solution of acetic acid. (i) Mineral acids are completely ionised. (ii) Carboxylic acids are completely ionised. (iii) Mineral acids are partially ionised. (iv) Carboxylic acids are partially ionised. Explanation: Mineral acids like nitric acid, sulphuric acid are stronger than carboxylic acid as they can ionize 100% in their solution. Explanation: Electronic configuration of carbon is 2, 4 hence it contains 4 valence electrons and after formation of 4 covalent bonds, it will get 4 more electrons through them so total would be 10 electrons that is atomic number for Neon gas. Explanation: In water molecule, center oxygen atom contains two lone pairs of electrons and form two single covalent bonds with two hydrogen atoms. Question. 23 Which of the following is not a straight chain hydrocarbon? Explanation: A branched chain hydrocarbon must contain some side chains which are bonded with parent carbon chain. Question. 24 Which among the following are unsaturated hydrocarbons? Explanation: Unsaturated hydrocarbons have multiple covalent bonds (double or triple bond) like alkene and alkyne. Question. 25 Which of the following does not belong to the same homologous series? Explanation: Successive members of same homologous series are differ by - CH2 unit. CH4, C2H6, C3H8 belong to same series that is of alkane and differ by ─ CH2 unit but C4H8 does not belong to this. Explanation: Compound contains three carbon atoms so prop- would be root word and – CHO functional group so suffix will be –al. Hence name would be propane + al = propanal. Explanation: Atoms other than C and H in organic compound are called as heteroatoms. Question. 28 Which of the following represents saponification reaction? Explanation: Saponification reaction is reaction of ester with base like NaOH to form the parent alcohol and sodium salt of carboxylic acid. Explanation: Alkyne is an organic compound with triple covalent bond between two carbon atoms therefore first member of homologous series must have atleast two carbon atoms with one triple bond that is ethyne (CH ≡ CH).